Asphalt pavements have what is called a “service-life.” On average, this is 12 to 15 years, but to get the most out of your investment, we want to get you closer to that 15-year lifespan. Your pavement’s service life is lengthened or shortened by many factors. These include the quality of the initial installation, weather conditions, traffic flow and usage, and most importantly, maintenance. If your asphalt is damaged, the only way to prevent expensive headaches is to take care of it immediately. Deteriorated asphalt surfaces are unsafe, unsightly, and always get worse if not addressed as soon as possible. Fixing a crack or a pothole is affordable, and our asphalt repair experts can see to it quickly. An asphalt replacement or milling is a much more expensive and time-consuming matter. The two most common asphalt defects are cracks and potholes. Each seems like a small thing now but has the potential to cause lasting damage to your pavement. 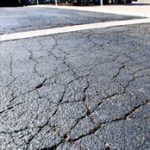 Cracked asphalt presents a significant danger to the health of your pavement. It is caused by many factors and has many solutions depending on the situation. What is guaranteed is it is more affordable to fix now than later. These are the three most common types of asphalt cracking. A weakened surface, base, or subgrade due to poor installation, drainage, or weather. A surface or base that is too thin. One or more of these factors contribute to this cracking. 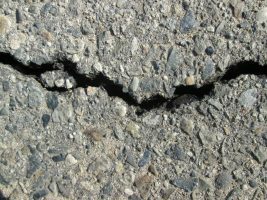 Without repairing the pavement and eliminating the cause, these cracks will spread over time until a full replacement is necessary. We repair alligator cracking by implementing what is called a full-depth patch. This solves both the surface problem and the underlying structural weakness. Block cracking is usually not indicative of a weakened base. Therefore, it can be fixed with affordable surface area patching in most cases. Edge cracks are crescent-shaped cracks near the edge of your pavement caused by a few factors. Edge cracks need to be addressed by removing their primary cause and repairing the pavement. 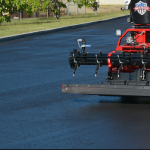 Depending on the situation, we will need to remove vegetation adjacent to the asphalt, improve the drainage and seal the cracks using an appropriate asphalt crack sealing product. Maintenance is the most effective tool at your disposal to combat the degradation of your pavements over years of heavy traffic and adverse weather. While we can’t control the weather, we can be proactive and get in front of issues before they get out of hand. We provide a wide range of asphalt repair and maintenance services to give ongoing support to our customers and keep their pavements safe, protected and looking sharp. From crack and pothole repair to preventative maintenance, we’ve got you covered. Whether your asphalt needs significant repairs, or you just want to prevent expensive repairs, give us a call. We’ll provide you with a free, no-obligation quote. Installing an overlay is an affordable alternative to a complete asphalt replacement. It involves installing a new 1 ½ to 2-inch layer of asphalt over the existing pavement. We recommend an overlay when the existing surface is in good shape with elevations that will still allow for proper drainage. 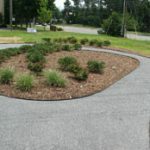 We can mill the edges of your pavement near the curbing, gutters, or other non-asphalt features such as manhole covers. This allows us to push the boundaries of your asphalt below these adjacent structures. We can then install new asphalt at the same level. 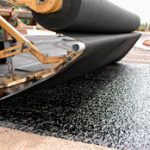 This serves to prevent water from becoming trapped between the asphalt and non-asphalt structures and preserves the pavement’s drainage patterns. 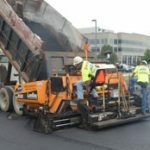 Paving fabric is installed between pavement layers and goes a long way toward maintaining the asphalt structure. It provides a barrier to water penetration, reducing cracking and pothole development. When used together with an overlay or brand-new construction, it’s a powerful tool to extend the life of your pavements. Like cracks, potholes allow water and debris into your pavement which will damage it significantly if not repaired immediately. Potholes are also safety hazards to pedestrian and vehicle traffic. These repairs are usually conducted through asphalt patching. It’s a process that involves removing the damaged asphalt down to a specific depth and pouring in new hot-mix. This serves to strengthen the weakened pavement and extend its service life. We complement the patching by applying crack sealer and a fresh seal-coat to ensure lasting protection. 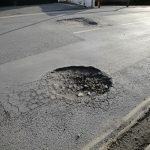 If a pothole has developed on your pavement, give us a call immediately. We’ll take care of it at little cost to you. Sealcoating is the number one way to protect your pavements and prevent problems from happening before they even get a chance to start. Simply put, a sealcoat is a protective layer applied to the surface of the asphalt that preserves its look and protects it from moisture, debris, and sunlight. A sealcoat should be applied within one year of initial installation, and every following 2-4 years. If you are overdue for your next sealcoat, it is never too late. It is essential to fill cracks as soon as you notice them. 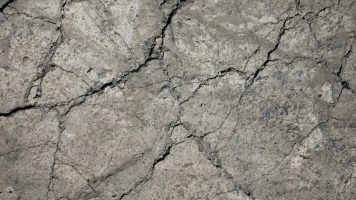 Cracks allow moisture to seep into your pavement and damage its foundation. They will spread and grow larger over time allowing even more water into your asphalt. The overall damage will accelerate as they get worse and lead to an early and expensive replacement. 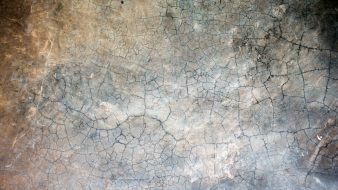 We provide expert and affordable crack sealing to prevent you from experiencing headaches and untimely expenses down the road. 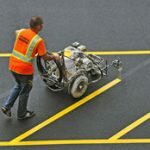 Restriping a parking lot is a great way to protect the asphalt. You can use the opportunity to redirect traffic, drawing it away from stressed areas of the pavement, ensure compliance with state and federal regulations, and may even get more parking capacity out of your lot. Our expert parking lot designers can help you by creating a safe, efficient, and healthy parking lot. 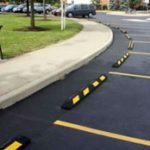 While restriping your lot, we can provide all the appropriate signage and accessories to ensure a safe and high-functioning pavement for your customers, visitors, and guests. We use a variety of devices to provide users with clear messaging. These include handicap parking signage and paint, reflective markers, no parking zones, tow warnings, and more. Maintaining your asphalt and protecting your investment is a lot of work, and it’s easy to let the years slip by without a thought. Why not just leave it to the pros? We provide our clients with affordable maintenance plans that will ensure your pavement enjoys a long life serving your business and making a great impression on your guests and visitors. We’ve provided parking lot maintenance to many Fairfax business owners for decades, allowing them to enjoy their pavements without unnecessary worry and stress. If you want to rest easy and save money on expensive asphalt repairs and replacements, give us a call. We’ll provide you with an estimate on a comprehensive maintenance plan that will guarantee a long-lasting surface. As soon as you identify damage on your pavement, don’t hesitate to give us a call. 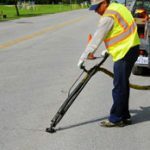 Our asphalt repair experts will provide you with a quick and cost-effective solution to remedy the problem before it becomes an expensive endeavor. Whether you need a one-time repair, a fresh sealcoat, or a long-term maintenance plan, don’t hesitate to give us a call. We’ll discuss your needs and provide you with a no-cost, no-obligation quote today and get it taken care of in no time. Just pick up the phone or fill out the form below, we are standing by to serve you.